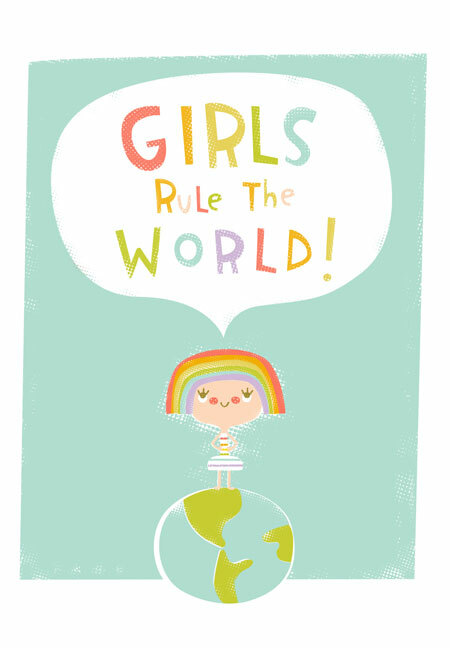 These past few months listening to the news, my heart has been breaking for girls of the world. Besides trying to fill my own girls up with self confidence and self respect… I was feeling powerless. I find the world turns on girls in very subtle ways, very early. My sweet 8 year old girl sees no diffrenece between her girl and boy friends. She actually even more boy friends than girls. But I’m noticing things are changing. Now in Grade 2 boys are starting to not want to sit with her on the bus or play with her for fear of being teased. This makes me really angry. Gender separation is such a dangerous thing. It focuses on difference and encourages lack of respect… which leads to much bigger problems later on. This has all made me want to do something. So I drew this picture. Don’t get me wrong, I think boys rule too. I love all of Sosi’s little boy friends. I just really want my girls and all the girls of the world to know they are just as good as boys, and that there is nothing they can’t do. They can rule the world. i love this, thank you Lori. My Addie, too. She announces that she “played with Fergus and Trevor at lunch today” almost more then she annouces that she “played with Jocelyn or Nayah”. Most often though, it’s a big mix of both boys and girls who play happily together. I love it that in Kindergarten, for now anyways, the boys and the girls seem to be pretty much on equal ground. I’ve sort of had my fingers crossed that this comradery would last… but I know the world and my heart hurts a little already. xoxox. This morning I was sitting out having lunch with Reid, and overhearing 2 ladies’ conversation next to us (I really try not to listen in, but Reid never utters a peep and sometimes it’s just so hard not to!) The two women were talking about the boys in their daughter’s class at school, and how some of the boys play really rough with their daughters. “so and so threw a brick at my daughter” and “so and so kicked my daughter in the crotch”. on and on. Their conversation came round to “well, it’s the end of the year.. if it was October maybe it would be different” and “the boy probably just likes my daughter and doesn’t know how to express it” and “That’s just how boys play what can you do”. I was horrified – sitting there overhearing all of this, with my sweet little boy by my side. If that is my son someday – treating anyone like that, kicking crotches and throwing bricks (!?!) at his classmates (girls or otherwise!!! ), I don’t see how I would find that acceptable whatsoever. I hope I am not setting him up to be some wimp in a man’s world… but to me that sort of behaviour is unacceptable, and it is just not right that it’s accepted and expected that boys be gregarious jerks who will always treat girls like they are meant to be abused….